Many – maybe even most – of the American composers of light music during the first half of the 20th century had European roots: Rudolf Friml (1879 – 1972) was Czech-born, Sigmund Romberg (1887 – 1951) was Hungarian, Viktor Herbert (1859 – 1924) was Irish, Irving Berlin (1888 – 1989) was born in Russia but came to the US at the age of five, George Gershwin (1898 – 1937) was born in Brooklyn to Russian immigrant parents and Jerome Kern (1885 – 1945) was born in New York to a German Jewish immigrant father and his Bohemian-American wife. He had already written his first song when he enrolled at the New York College of Music, and at the age of seventeen, on his first visit to England he contributed material to a show there. Back in N.Y. two years later he worked as a Broadway rehearsal pianist and also provided songs for Broadway versions of London shows. His first big hit was an interpolation in The Earl And The Girl titled How’d You Like To Spoon With Me? And the best-selling recording of this 1905 song, recorded the same year, is included here (CD 1 tr. 2) – a real rarity, sung by Corinne Morgan and The Haydn Quartet which, in spite of the name, wasn’t a string quartet by a male vocal group. From that auspicious debut we can follow Kern’s development chronologically through a 40-year career as composer of musicals and, from the mid-30s mainly of film music. Some of the singers are more or less forgotten today, but that doesn’t necessarily mean that they are bad, and quite a few of the songs are here presented in recordings made when the songs were brand new. Among the singers who have retained their popularity through the years we find the young Frank Sinatra and Dinah Shore – the two were almost contemporaneous – the latter sings very beautifully in They Didn’t Believe Me. Bing Crosby croons nicely in The Folk Who Live on the Hill. Paul Robeson naturally sings Ol’ Man River from Show Boat – the role of “Joe” was written for him but he first sang it in the 1928 London production, the year after the Broadway premiere. The recording here is from 1932, when Brunswick issued several discs with excerpts from Show Boat. Helen Morgan, who sang in the original Broadway production, is here represented by Can’t Help Lovin’ Dat Man and Bill and tenor James Melton sings You Are Love. Melton (1904 – 1961) was a popular singer in the 20s and early 30s but tenor voices went out of style in popular music in the 30s and Melton began a new career as operatic tenor in 1938, appearing with many of the great singers in the US on several important opera houses, finally landing at the Metropolitan Opera in New York in 1942 and continued there until 1950. Pearl Bailey’s Don’t Ever Leave Me is also a worthy performance. It is from the 1929 musical Sweet Adeline. In 1933 came one of Kern’s best scores, Roberta, with songs like Yesterdays, here charmingly sung by Frank Luther. In The Touch of Your Hand we hear Kathryn Grayson and Howard Keel from the filmed version of Roberta in 1952. At about the same time they also starred in the Show Boat film with Keel as Gaylord Ravenal and Grayson as Magnolia. Smoke Gets in Your Eyes is here sung by Ruth Etting, recorded in 1934. A very attractive reading. After Roberta Kern wrote principally for films and CD 2 covers that period excellently. Swing Time (1936) featured Fred Astaire and there are five songs with him, including library versions like The Way You Look Tonight and A Fine Romance. Percy Faith’s 1951 recording of Waltz In Swing Time has also retained its appeal through the years. Very Warm For May (1939) was one of the few musicals Kern wrote during this period and Tony Martin recorded All The Things You Are in 1946. He had a long career both as singer and film actor and passed away as recently as 2012, aged 98. Another hit song from this musical was That Lucky Fellow, here sung by Mildred Bailey with Benny Goodman and his orchestra, who were in the front line in the big band business in 1939. Remind Me from the film One Night in the Tropics was a song new to me, but Julie London’s husky delivery caught my attention. Kern was nominated eight times for an Academy Award and won twice. The first time was in 1936 for The Way You Look Tonight, the second time was in 1941 for The Last Time I Saw Paris from Lady Be Good. An interesting fact is that he didn’t write the song for the film. He composed it the year before for his friend Noël Coward, and it is this version we hear on this set. Among his later nominations was More And More from Can’t Help Singing (1944) which starred the lovely Deanna Durbin, whose delicious light soprano is heard here in the nominee as well as the title song Can’t Help Singing. 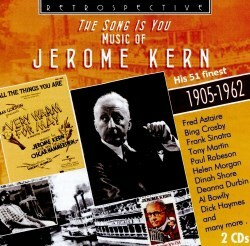 The bonus track is Jerome Kern’s greatest hit of the 1950s, Smoke Gets In Your Eyes in the Million-selling recording with The Platters. My sister had the EP and played it to excess, I thought then. Hearing it again after all those years I can establish that it has aged beautifully. From all points of view this is a great compilation. The songs have stood the test of time, the recordings are chosen for both historical and artistic reasons. Those I have mentioned specifically are either personal favourites or songs with some interesting facts surrounding them. The documentation is, as usual with these Retrospective issues, comprehensive and the transfers excellent. It was a joy to play the cram-full discs through in one continuous sitting and it will be a pleasure to dip into them for specific songs in the future.